The Ski & Glacier World Zillertal 3000 can be found at an amazing altitude of up to 3,250 m above sea level. Guaranteed snow and the possibility of year-round skiing on the glacier. The lift system up to the glacier is impressive, with three new consecutive funitels which whisk you up to the dizzying heights of the top station and a spectacular vantage point. In the summer, the glacier is open for those of us who needs a quick summer ski fix. A special attraction is the “glacier round”. With its 72 km departures and 15000 elevator meters it is a fascinating challenge for a day trip. Also try visiting the inside of the glacier – 30 metres under the trails you will find ice that is thousands of years old and you can even have a boat trip on the glacier lake in complete darkness! Previous story Where to Go Skiing in the Summer? First trip to Hintertux ever and very positive! Snow conditions seem great already here in November, a little warm though but on the glacier slopes it is really good! That was fun 🙂 I have never tried summerski before but we decided to combine a summer trip of trekking with a few days on ski. Felt a bit weird to be skiing in 10 degrees and sunshine but the snow was okay (in the morning…) and we didn’t expect much so it turned out to be quite a lot of fun. You need to get up there early – at noon it is over and you can start your “normal” summer holiday, trekking or whatever. By the way the Hintertux area is really nice for biking, trekking etc. Just home from Hintertux and a late season trip – still lot’s of snow actually and quite nice whether. However it seems the mountain is tricky in terms of fog. Have been here once before and at the time we was also surprised of the speed in change of conditions. From sunny weather to fog and zero visibility in an hour. Quite scary. Anyway I like the area and it can change as quickly from bad weather to good weather as the other way around, but just be prepared to change plans if you run into a day with bad conditions. Great weather In Hintertux right now! Nice snow at the top – summer In the valley – love this place ? Not a huge resort but very high standard and great pistes. Because of the glacier this is one of the best places if you want to start early in the season – they have great snow coverage in December already. Hintertux and Zillertal valley is a very great place for both intermediates and pros’. It is very snow safe because of the glacier. We have been here a couple of times and would probably be coming back, maybe even in the summer time. I have never tried summer ski, so this would be something I would like to come back to Hintertux to try out. You should have no worries going to this area. Was skiing here in April 2015 and I gotta say it was really amazing. The actual Hintertux resort has amazing views from high altitudes with good skiing conditions late into spring. However the snow does get quite soggy in the afternoon and wet if you ski down to the village. Overall there’s a lot to ski around the Zillertal valley. I would highly recommend this place! Hey – we have visited Hintertux twice in the summer and it is a really nice place. The weather can be really tricky in the summer with lots of fog making it impossible to ski and mind also that the glacier can be quite icy. However if you want a couple of days/hours of skiing in the summertime you will have a great opportunity and there is plenty of things to do even if the weather is not great on the mountain. You can visit the inside of the glacier which is really amazing, you can play tennis on the public courts in the valley or you can rent bikes (e-bikes 🙂 if you are lazy). I would like to go here in the winter as well as it seems to be a nice and well structured area. 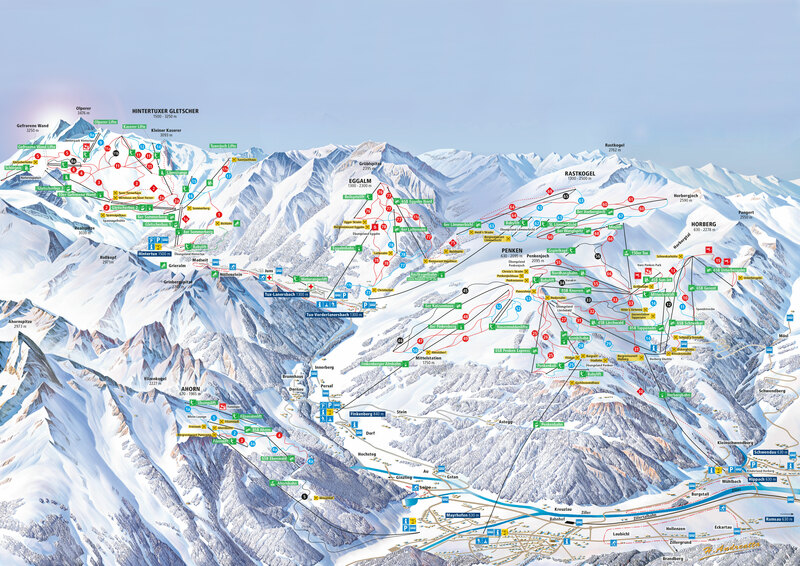 Mind that you will probably not live near the liftstation (as there are only a few hotels here) but the small “towns” further down the mountain is connected with a free shuttle bus and that works well so you will be at the Hintertux lift station in just 5-10 minutes. It is worth a visit.